The mining town of Captains Flat has a fascinating history that has not previously been recorded in detail. It was one of the many gold mining prospects that had a brief moment of glory in the 1880s and more substantial base metal mines were established there in the late 1880s. An injection of English capital in 1896 raised hopes of prosperity and large processing facilities and a steam operated tramway were established. Unfortunately, the processing technology of the time could not handle the silver-lead-zinc sulphide ores and the mine closed in 1899. For The development of the 'selective flotation' process during the early twentieth century, particularly at Broken Hill, brought new hope for development of the ore bodies at Captains Flat. Again English capital came to the fore and the company Lake George Mines Limited was floated in 1927 to develop the field. The onset of the Depression and negotiations over the construction of the branch railway line from Bungendore to Captains Flat delayed the start of production until 1939. 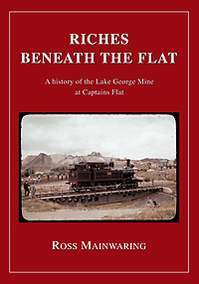 Ross Mainwaring's book covers the history of Captains Flat and its mines through to 1939 in some detail, but his primary focus is on the operation of the Lake George Mine from 1939 through to its closure in 1963. Using company records at the Noel Butlin Archives of Business & Labour at the Australian National University and extensive newspaper research, Ross has drawn together a fascinating history of the company, the men who mined and transported the ore, and the community of Captains Flat during these years. Particular attention is given to the underground railways used to haul the broken ore from the stopes to the main vertical shaft for conveyance to the surface, but there is also extensive coverage of the transport of the ore concentrate by rail from Captains Flat to Port Kembla for export. In short, it is a thoroughly researched and well-written history that will provide readers with an enhanced understanding of the working conditions and challenges of the mine and its role in sustaining the community.